The number of portfolio landlords is increasing. 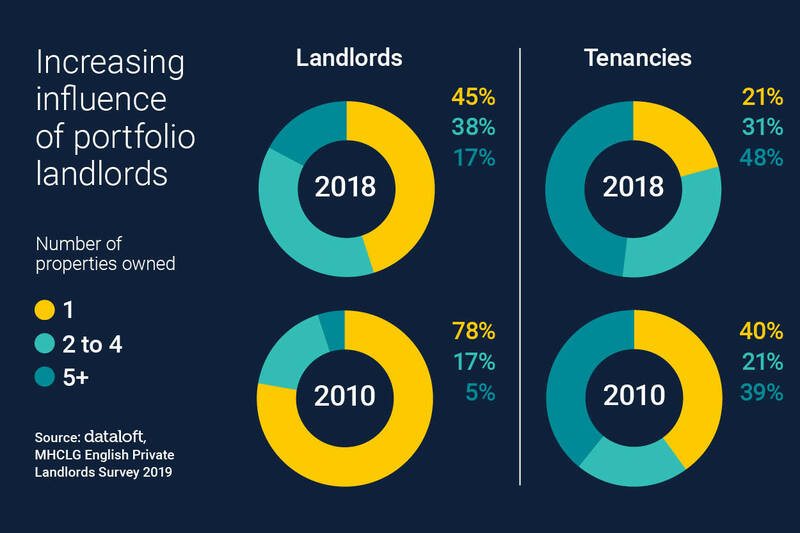 In 2018 one in every six landlords had a portfolio of five or more properties, up from one in 20 back in 2010. It is estimated such landlords now account for virtually half of all tenancies. In comparison, the number and influence of single property landlords has decreased. In 2010 three-quarters of landlords had just one property, today that figure is less than half. In 2010 such landlords were responsible for 40% of all tenancies, today it is just 21%. Landlords with over 100 properties now account for 3.1% of all tenancies in the market and it is highly likely that the next reiteration of this survey will see this figure increase dramatically as the sector responds to current demands. Latest data from the British Property Federation indicates levels of construction in the Build-to-Rent market are up 40% year on year. 80% of landlords with a portfolio of over 100 properties are companies.